I woke her up at 8:05 a.m.
She had a rough night. We all did. With four kids sick with the Great Cold of 2014, I had spent most of my night slathering on Vicks, refilling water bottles, rocking a baby and fetching more tissues. This daughter shone her flashlight on my face at 5 a.m. to announce tearfully that she hadn’t slept all night and now she’ll never get any sleep and she’ll fall asleep at school and she’ll never make it to ballet…..and the world was just absolutely going to blow up because of all of it. I’m not the most compassionate nurse of a mom anyway. Seeing as how that was about the bazillionth time a child had woken me up in that one night, I had to muster some grace for the night shift. Walk the child back to bed. Hand plastic bag for placing used tissues inside instead of dumping them on the floor next to your bed (please and thank you). Speak truth. The world is not about to end. Stop crying. If you cry, you will feel worse. You have not been awake all night; I have and I can assure you that you were asleep for some of it. Place hand on child’s head, smooth back hair, reassure self that she does not have a fever, and pray for her to sleep. Dear God, please let her sleep. Make it back to the bed in time to fall asleep before the next child wakes up an hour later. Lunchbox in backpack. Book in backpack. Zip it up! Brush your teeth and I’ll brush your hair while you do that. Saves time. But I look at this child in the mirror. She’s still crying and she’s a mess of red-faced blotchy miserableness. She’s sick and she’s tired. I could push her out that door to meet the bus. But something in me stops the stampede of my pushy, workaholic, drill sergeant self all over the tender heart of this beloved girl. I hear it, this strong voice telling me to just stop right there and: Love her. “It is a cure for an affliction may of us have, which my friend calls destination disease. That great phrase describes being more concerned about getting to our destination than in finding delight on the journey. Learning to love causes us to linger in the company of others and find enjoyment and companionship along the way” (Katie Brazelton). Learning to love isn’t just a begrudging necessity of this Christian life, a small blip in the journey on to bigger and better purposes and plans. Loving others is Christ’s command. 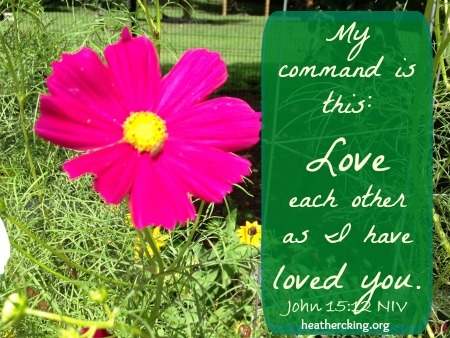 My command is this: Love each other as I have loved you. (John 15:12 NIV). Loving others is what we’re here to do. It is the great purpose. It is the great design. Am I too busy pushing my agenda in this moment to show the truth of God’s love and grace? “Love, then, is spending ourselves, investing ourselves, in the daily and eternal well-being of others” (pp. 64-65). I could push that daughter out the door to the school bus and she’d make it okay. But that wouldn’t be loving her. Not this time and not in this way. This child is not a hookie-playing, school-skipping, excuse-making kid. She’s a good kid and a diligent student who is sick, got too little sleep and feels rotten. I love her and I want her to know that I love her. So, I send two kids out to the bus instead of three. I write a note to her teacher. I make her a cup of tea. An hour later, she is feeling a bit better. She still has a cold, but she says she’s ready to go to school. This month, I’m Learning When To Say “Yes” as part of my year-long pursuit of the presence of Christ. And I pause here today because saying “yes” isn’t one choice or one destination. It’s a lifestyle of listening in the moment. I say “Yes” to the Spirit’s voice. “Yes” to His direction even in the smallest of things, the every day, and the ordinary. And today I say “yes” to loving others, starting with this precious girl. How can you love others today?